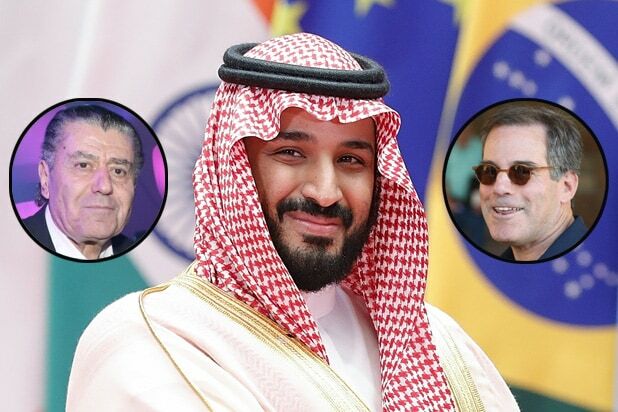 The Crown Prince of Saudi Arabia continues his charm offensive in Hollywood, dining privately on Tuesday evening with Israeli-American media mogul Haim Saban, Republican strategist Dan Senor and private equity media investor Jonathan Nelson, TheWrap has learned. According to an individual with knowledge of the meeting, the four-hour dinner had Mohammed Bin Salman al Saud expounding on his vision of an economically diverse, culturally significant Saudi Arabia, a message he has been selling hard in a jam-packed trip to Hollywood and later in the week to Silicon Valley. Saban is a noted Democratic donor and devoted Israel supporter. Senor is an investor, author and former foreign policy adviser to Mitt Romney and Paul Ryan. And Nelson is the founder of the $40 billion private equity firm Providence Equity Partners, which has invested in media companies including Hulu, The Chernin Group, Warner Music Group and Univision. The crown prince, according to the insider, talked about bringing culture to Saudi Arabia. Dalian Wanda-owned AMC announced Wednesday it would open the first two cineplexes in the country’s modern history, and the laws have been loosened to soon allow women to drive. The 32-year-old monarch has embarked on a strategy to diversify Saudi Arabia’s economy as oil becomes less reliable, and to open the country’s harsh Islamic restrictions. The conversation turned, not unexpectedly, to Saudi relations with Israel, as this is a major concern for Democratic donor Saban, who also holds Israeli citizenship. The crown prince suggested the time had come for a new era of relations between Israel and Saudi Arabia, the insider said, and that a “rapprochement” could happen once there is “significant progress at the Palestinian-Israeli level,” though he did not specify what that would mean. The crown prince has won points with Israel in recent weeks by allowing Israeli flights to India to pass through Saudi air space — something that had previously been forbidden and extended flights by several hours. According to the individual with knowledge of the dinner, there was no discussion of any political opening in the Saudi kingdom nor of the crown prince’s recent moves to shut down rivals by arresting members of the royal family. The Saudi consulate and Saban had no comment. Senor did not respond to a message requesting comment. Nelson could not be immediately reached for comment, and his office said they would get back to TheWrap. Oh, right — and the menu for the meal? Italian.